The inspection of the exterior walls of a facility or residence requires an understanding of the entire structure. There are many opportunities for a wall system to exhibit failure. 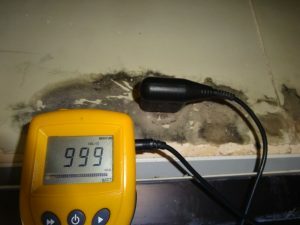 These include unsafe loading, water intrusion, and lack of proper connection. These conditions can be a result of a number of challenged associated with top wall, flashings, fenestration systems, proper use of fasteners and connections, and adequate concrete coverage. Each of these construction defects require a different set of tools and methodology for understanding corrective actions. We utilize testing established by ASTM1102, which is a method of applying water under pressure to exterior walls and windows. 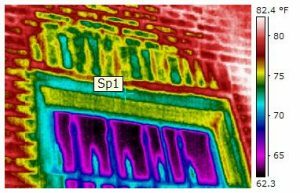 Additional testing is achieved through the use of thermal imaging. The lack (or abundance) of latent energy under an infrared scan is a non-destructive method of determining locations of likely water accumulation. In addition, we utilize GE protimeters to test the relative moisture content of various building components. A thorough understanding of how a wall works is paramount to inspecting same. Thermal imaging technology used by Complete.